The origins of the name “Yamagata” can be traced back to the early Heian Period (794-1192) of Japan. A dictionary from that time period entitled Wamyo Ruijusho refers to the area to the south of what is now Yamagata City as a province called “Yamagata.” At that time, “Yamagata” was written with different kanji (Chinese characters) than it is today, meaning “place with mountains.” The reason why this area was called Yamagata is unclear, but mountains including Mt. Zao and Mt. 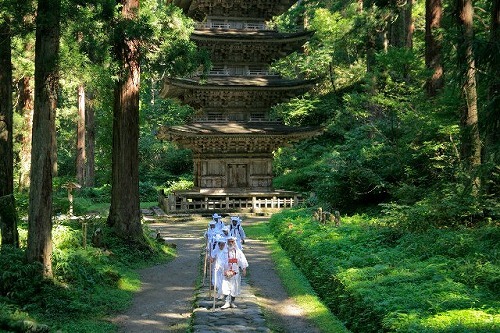 Ryuzan that are known for their connection to traditions of mountain spirituality and asceticism can be seen to the south of present day Yamagata City. The name “Yamagata” does not appear in historical documents again until the Nanboku-cho Period (1336-1392). When Shiba Kaneyori located the center of his government in this area and the political situation became more stable, the name “Yamagata,” written in the same kanji as it is today, began to appear again in various documents, such as those concerning the buying and selling of land. Both natural and manmade relics from the Jomon Period (12,000 BC-400BC) have been found throughout Yamagata Prefecture. Yamagata is currently the home to the largest Beech Forest in Japan, and at the time it is believed that even the flatlands of Yamagata were covered in a forest of deciduous, broad-leaved trees that provided a bountiful source of food to the residents of ancient Yamagata. One of the oldest earthenware relics of the northeastern Tohoku region of Japan was excavated from geological layers over 10,000 years old in the Hinata Cave archeological site, located in present day Takahata Town. Additionally, a 45cm tall earthenware figure of a woman referred to as the Venus of the Jomon Period, which is thought to be one of the largest extant earthenware figures of the era, was excavated from the archeological site at Nishinomae, located in present day Funagata Town. Later, the rice-centric culture of the Yayoi Period (400BC-300AD) spread to Yamagata. Burial mounds dating back to this period, including the 96 m long Inarimori Burial Mound (located in present day Nanyo City) and also numerous keyhole shaped burial mounds, can be found in Yamagata. The line of burial mounds that stretches from south Yamagata through the south of neighboring Miyagi Prefecture contains the northernmost keyhole shaped burial mounds in all of Japan. Famous Dewa Sanzan in Yamagata. In September of the year 712, 2 years after Heijo-kyo in Nara became the capital of Japan, the Dewa District was separated from Echigo Province to establish the Dewa Province. Four years later, the districts of Mogami (present day Mogami and Murayama) and Okitama from Mutsu Province were incorporated into Dewa Province. Dewa Province at that time had roughly the same borders as present day Yamagata Prefecture, and it continued to expand further Northward, into the area of present day Akita Prefecture. The remains of Kinowanosaku Castle located in present day Sakata are believed to have been the center of the government of Dewa Province. 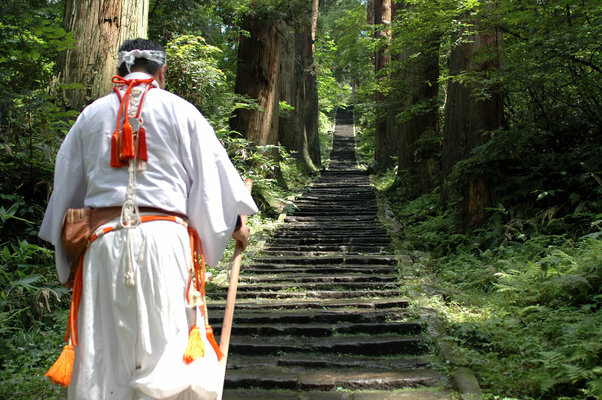 Many famous temples in Yamgata that still exist to this day were founded in this era, including temples created by mountain ascetics on the three sacred mountains of Yamagata known as the Dewa Sanzan (Tsuruoka City), the Jojaku Temple which is referenced in the song of Yamagata’s Hanagasa Festival (Tendo City), the Yamadera Temple, also known as Rishakuji, which is famous throughout all of Japan (Yamagata City), and the Jion Temple which houses a large collection of Buddhist statues (Sagae City). From the the Asuka Period (538-710) through the Heian Period (794-1192), Yamagata was shifting toward inclusion in the centralized government located in Kyoto and Nara, but near the end of the Heian Period Yamagata was recognized as being under the rule of the Oshu Fujiwara Clan. As a result of Oshu Fujiwara Clan rule, there are numerous legends about Minamoto Yoshitsune, a famous historical figure connected to that clan, passed down in the Shonai and Mogami regions of Yamagata. At the start of the Kamakura Period (1192-1333), Kanto Bushi warriors, who defeated the Oshu Fujiwara Clan, ruled the various regions in Yamagata. This led to the Oe Clan (including the Sagae Clan and Nagai Clan) ruling over the regions of Murayama and Okitama and the Mutou Clan (including the Daihoji Clan) ruling over the Shonai region. At first, they ruled the areas from afar via regents, but over time they began to settle within Yamagata Prefecture and became regional lords, taking on the name of the land they ruled as their clan name. When the Muromachi Period (1338-1573) began during the era of conflict between the Northern and Southern Imperial Courts, the Shiba Clan, which was based in what is now known as northern Miyagi prefecture, ruled the Oshu region. In 1356, they dispatched Shiba Kaneyori to rule over the Ushu region in Yamagata. The Shiba Clan established their base in Mogami, which was the name for what is now present day Yamagata. They changed their clan name from Shiba to Mogami and expanded their rule over the region. During the Warring States Period (15th century-17th-century), Mogami Yoshiaki moved his forces northward and expanded the Mogami Clan’s territory to include the Murayama, Mogami, and Shonai regions. At the same time, the Date Clan, which was based in the north of present day Fukushima prefecture, advanced through the south of what is now known as Miyagi prefecture into the Okitama region of Yamagata. They then relocated the base of their clan to the Okitama region during the Warring States Period. The Date clan achieved the height of their power during the rule of Date Masamune, who was born in Yonezawa Castle in 1567. He was also known as Dokuganryu, meaning “one-eyed dragon,” a reference to his military might and also the fact that he only had one eye. During the era of Date Masamune, the Date clan became the reigning Feudal Lords of the region of South Oushu, composed of the Okitama region, southern Miyagi Prefecture, and all of Fukushima prefecture except the Hamadori area. However, Toyotomi Hideyoshi, who brought an end to the Warring States Period, later commanded the area of the Date Clan’s rule to be reduced to only Miyagi prefecture. Feudal lord Uesugi Kagekatsu was part of the Western Army that lost the decisive battle of Sekigahara, the result of which led to the creation of the Tokugawa Shogunate, the final feudal regime to rule over Japan. After the battle, he was forced to leave Aizu for Okitama in 1601. Uesugi Kagekatsu and his retainer Naoe Kanetsugu then devoted themselves to the administration of the Okitama region. Due to the successes of the Tokugawa Shogunate, all of Yamagata prefecture with the exception of the Okitama Region and also southern Akita prefecture came under the rule of the great feudal lord Mogami Yoshiaki. However, in 1622 an order by the shogunate confiscated the land from Mogami Clan. The area once ruled by the Mogami Clan was divided into regions controlled by feudal lords close to the Tokugawa Shogunate and other regions under direct control of the Tokugawa Shogunate itself. This led the Sakai Clan to rule the Shonai region and the Tozawa Clan to rule the Shinjo region until the end of the Tokugawa Shogunate. On the other hand, while the Torii Clan was initially appointed to rule Yamagata, their reign was short lived and the rulers of Yamagata changed 13 times by the end of the era of the Tokugawa Shogunate. At this time, the area consisting of the majority of Yamagata’s Murayama region was the largest part of northern Japan under direct control of the Tokugawa Shogunate itself. Shipments of rice and unique products including Mogami safflowers led to a flourishing trade route along the Mogami River. The eventual establishment of the Western Shipping Route caused Sakata Port to become the most active port along the Sea of Japan. Sakata became one of a small number of thriving merchant towns in the country, and the Honma family that began in Sakata went on to become the biggest landowners in all of Japan. Honma Mitsuoka, a third generation member of the Honma family, is renowned for his efforts at promoting the public welfare, such as his devotion to the forestation of the Shonai Beach area. Additionally, Uesugi Yozan, the 9th generation head of the Uesugi clan, is revered as a fair ruler who reformed his clan’s struggling finances. Information gathered from the Yamagata city website. Original in Japanese. I will admit that I get emotional thinking about my connection to the brand, Don adds. I’m just a kid from Chicago who now works with Jordan. I’m honored. Let’s keep it going.